SIX MONTHS OF CONNECTIVE PRACTICE and PUBLIC FORUM PROCESSES at the EXCHANGE VALUES ‘table’. Led by Shelley Sacks. As part of the exhibition ‘A Global Table’. Curated by Abigail Winograd. PARTICIPATE in a FORUM as an individual / REQUEST A FORUM for your group or organisation / Be trained to FACILITATE A FORUM yourself. If you would like to use and present Exchange Values on the table, please contact Shelley Sacks. 10 Feb 2018 Participate in a social sculpture process on THE FUTURE OF WORK / THE FUTURE OF THE HUMAN BEING’. 12 Feb 2018 Social Sculpture process focusing on BEYOND MONOCULTURES with Renwick Rose and Alistair Smith from the World Banana Forum in Geneva. ALL DAY 10.30 – 16.45. Participation by invitation only. READ the Banana Link Bulletin. Includes articles about ‘Beyond Monocultures’ event. Exchange Values is a social sculpture process and arena for exchange in collaboration with farmers from the Windward Islands and their organisations. It creates a ‘permanent conference’ about how we live our lives, our relationship to global trade and trade agreements. It also explores the connections between imagination and responsibility or lived experience, and our ‘ability-to-respond’. 20 stitched ‘sheets of skin’ from 20 randomly selected boxes of Windward Island bananas form the basis of the installation. Shelley Sacks traced each box of bananas back to its origin in the Caribbean and recorded the voices of the growers. These recordings accompany each sheet of skin. Through the situation of the banana producers and the effects of ‘free trade’ in one particular region of the world, EXCHANGE VALUES emphasises the interconnections between producers and consumers in our complex global economy and our roles as ‘artists’ in re-envisioning our world. Through the integration of the aesthetic and the political, an imaginative space is created in which we can engage with the re-shaping and transforming of our lives and our society, and explore ways to develop a more participatory and sustainable society. This expanded workspace where we work with the invisible materials available to us all, where the personal and social imagination moves and weaves, is a creative space accessible to all. To hear the growers click a number in the two columns above. 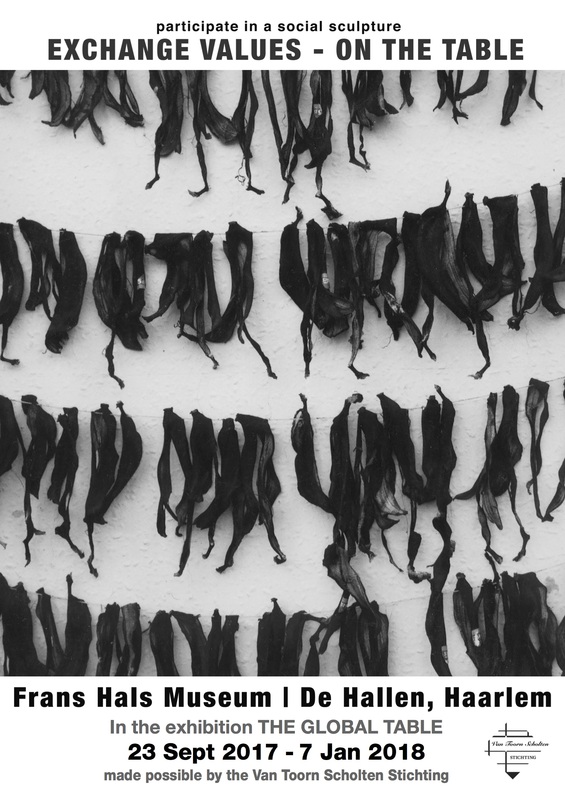 EXCHANGE VALUES has always created arenas for dialogue and for ‘imaginative work’: in the Windward Islands with the farmers and their organisations since the early 1990s, and in all 12 venues where the Exchange Values installation was presented between 1996 and 2006. These dialogues have brought together and engaged consumers, farmers, NGOs, activists, teachers, ecologists, artists and others from many disciplinary backgrounds in challenging reflections and imaginative exchanges. 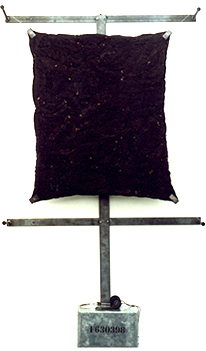 In 2007 a new element was added to the original EXCHANGE VALUES: Images of Invisible Lives. This is a huge UN-like round table. ‘EXCHANGE VALUES on the table’, as it is now known, is in many respects the same as the original project. But with one significant difference. 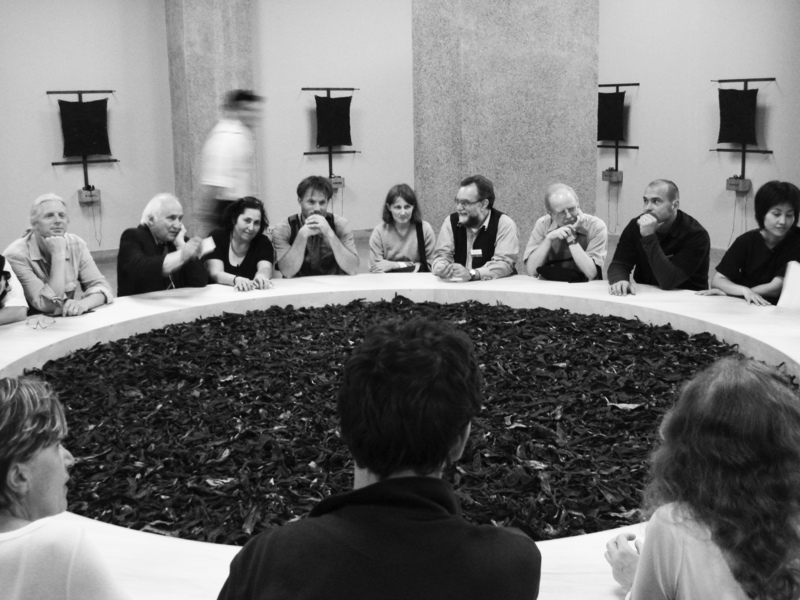 A 5-meter round table – filled with thousands of skins from unknown producers – takes the place of the 10,000 unnumbered skins that were once laid out on the floor. A permanent space for dialogue and exchange is thus highlighted as an integral part of the social sculpture work. Every person who enters the space becomes a participant, whether or not a planned forum is in progress. The need for what Joseph Beuys described as the ‘permanent conference’ is emphasised. 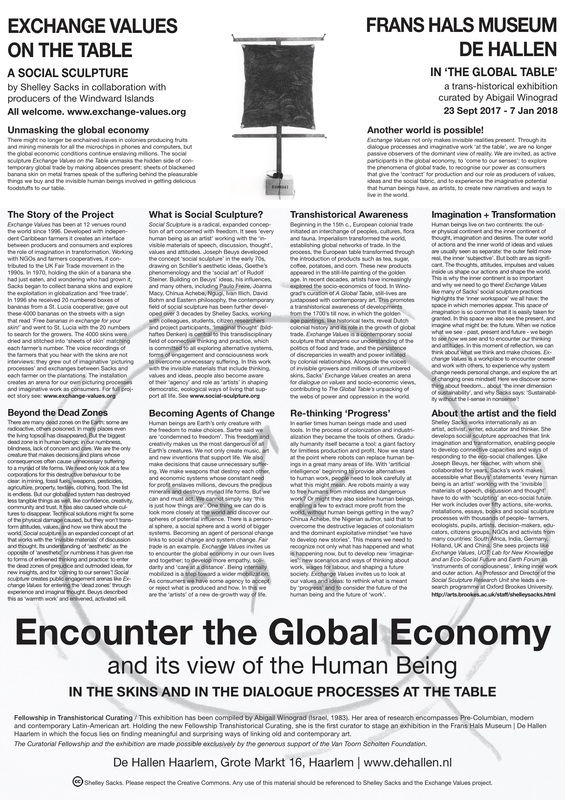 ‘Visitors’ quickly become aware that they are not visitors in the global economy. Each of us on the planet is engaged in complex relations with people and other life forms. Research on EXCHANGE VALUES begun over 20 years ago. For over two decades it has brought together a whole spectrum of people: activists, farmers, economists, government ministers and officials, ecological campaigners, artists, psychotherapists, engineers, cultural geographers, writers and of course, consumers. Many ‘social sculpture’ forums have taken place during the course of the project: whilst collecting the skins from members of the public over two weekends in the centre of Nottingham, where free bananas were given out in exchange for their skins; in the Windward Islands with growers and sustainable development activists, and in the social sculpture forums that take place alongside the physical installation in each venue. Here, at the table and in the installation, we can begin to live into the questions and let the images and experiences work in us. This experiential-reflective process is designed to mobilise us internally and enhance our ability-to-respond. colonialism, conquest and control to cooperation, consciousness and care.